The good-old-days of the double digits growth are behind us as the major players shift their focus to younger product segments and emerging markets. Meanwhile nimble challengers are chewing into market share with innovative technologies. Can CMOs keep up with the changes? In the second part of this interview, Ali Madani from Avicenne Medical shares insights from recent completed studies. What is the real potential in emerging markets? What role will niche products play in the next five years? What is the impact of regulatory changes? You might want to catch your breath. While it’s true that expansion of contract manufacturing organisations (CMOs) in the orthopedic industry has been breath-taking with new acquisitions, the trend is not going to stop anytime soon. And according to Ali Madani, founder and managing partner of Avicenne Medical, the biggest and the best is yet to come. 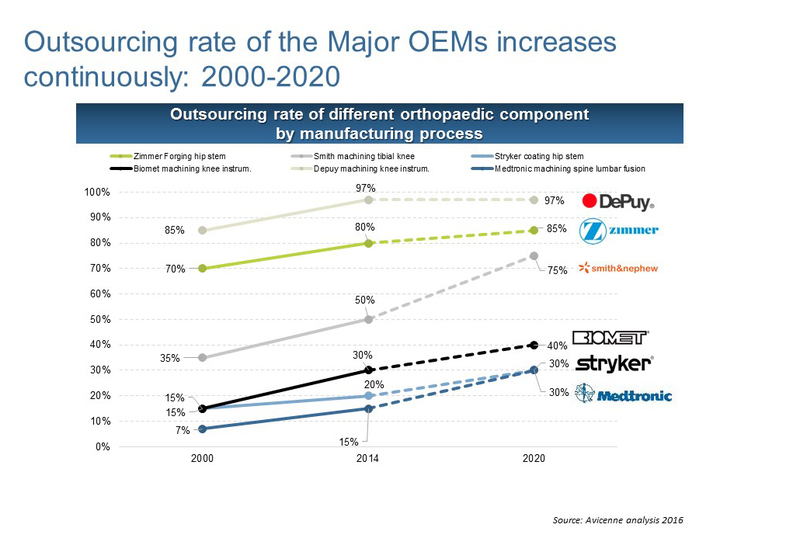 Ahead of the IMPLANTS 2017 conference on June 8 in Paris, Madani shared insights from his study of trends product manufacturing by major orthopedic companies and how he believes the CMO market can further expand and evolve. In the first part of the interview, Madani described the need for greater structure in the CMO sector, and detailed the opportunities to be realized. In this second part of the interview he sharpens the focus with a comparison of the trends driving expansion for OEMs and the factors shaping growth among CMOs. IMPLANTS: Why are you convinced we will see further expansion of major CMOs? Ali Madani: Purely in terms of size we can see even the largest CMOs today are too small for the opportunities tomorrow. Today we are looking at a sector where the largest supplier generates some $500 million per year, compared to a major OEM with sales of $10 billion that spends something on the order of $2 billion to produce its products. Our studies at Avicenne show the average among the top 15 CMOs is $142 million in annual revenue. Right off we can see why the major OEMs do not have any alternative but to manufacture their products themselves. There is simply not an alternative solution available! Even the biggest CMOs are not capable of providing a full offer to the majors. These companies are too small to absorb the volume of production from the majors. When an orthopedics company with $10 billion in sales is working with a subcontractor that generates just $10 million in sales, we can safely say there is not a sufficient structure with levels of sophistication as we see in the automotive or aeronautics industries. There is room to grow. IMPLANTS: How would you summarize the market drivers affecting CMOs? Madani: Clearly the heavy trend will be for more outsourcing from all OEMs. Yet the OEMs would like to externalize more than products, and we can expect to see a divestiture of implant manufacturing facilities to those CMOs capable of handling the responsibilities. Finally, the headline trend for CMOs would be opportunities in the growth of the market share for challengers to the major OEMs. These nimble competitors tend to outsource as much as 80% of their production, a high outsourcing rate comparable to what we see in other industries. As a result, the growth of challengers will also grow the business for CMOs. CMOs need structure as well as size! The prospect of greater OEM divestiture of production facilities. The market for orthopedic implants can be seen as mature with basic products that have reached the commodity stage of competition. Yet the orthopedic industry itself is relatively young, having emerged only 20 years ago, according to Ali Madani, the founder and managing partner of Avicenne Medical. From this point of view, he says, the constant consolidation among contract manufacturing organisations (CMOs) over 15 years can be seen as the normal and healthy development of an industry in its adolescence. And like a teenager, we can expect to see continued, even faster expansion as this vital segment of the orthopedics industry strives to realize its full potential. Ahead of the IMPLANTS 2017 conference on June 8 in Paris, Madani focused in this interview on a study of trends in outsourcing of product manufacturing by major orthopedic companies and he shares his perspectives on how the CMO market needs to evolve, and quickly, to capture a vast opportunity. IMPLANTS: We have seen a non-stop expansion of a few major CMOs, Is there no end in sight? Ali Madani: There has been a tremendous concentration among CMOs through acquisitions. 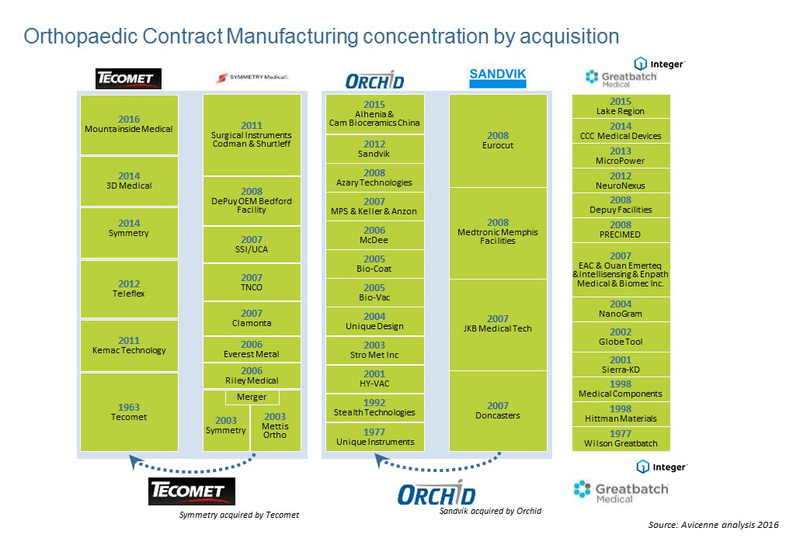 Industry leaders like Tecomet, Orchid or Greatbatch have been built over 15 years by an aggressive acquisition of smaller contract Manufacturers. In fact, these companies are responding to a generalized and global manufacturing trend where the major OEMs [original equipment manufacturers] are pushing for more and more outsourcing of production. IMPLANTS: Yet at the same time the major OEMs continue to expand their in-house production. Madani: Because they have no choice! Because they do not see enough robust solutions coming from the CMOs to meet their needs. The players in the CMO space today are not structured enough to meet the real opportunity coming from the OEMs. Yes, we have seen Tecomet, Orchid or Greatbatch, now called Integer, growing year after year through acquisitions, and we can expect this trend to continue, not only for the major players but among the medium-sizes CMOs as well. New European regulations covering medical devices will be final in June – just in time for the IMPLANTS 2017 conference in Paris. We spoke with the Director for Regulations and Industrial Policy at the industry association MedTech Europe in Brussels, John Brennan, about how the new rules will hit orthopedics and implant manufacturers. More demanding technical and clinical files. In June 2017 the European Union’s 30-page Medical Device Directive will be formally repealed and replaced by the 600-page Medical Device Regulation (MDR). The changes are broad and deep. For example, every medical device with a CE Mark already approved and on the market must be re-certified under the reformed laws before 2020. Since the draft text of the MDR was released in 2016, manufacturers have been calling John Brennan, Director for Regulations and Industrial Policy at the industry association MedTech Europe in Brussels. And he said they all have the same pressing concern: What do we have to do and by when? Will orthopedic robots follow the daVinci curve? Why robots are attractive to patients and create market pull. Given a choice, patients will opt for minimally invasive surgery (MIS) every time. The pull is so powerful that men will switch hospitals just to have a daVinci robot from Intuitive Surgery assist with a prostatectomy. According to Bertin Nahum, who headed robotic development for Zimmer-Biomet, orthopedics implant manufacturers should pay close attention to what happened when a robot entered the field of urology. Where until recently surgeons cut a man open for prostate gland resection, today in the United States 90% of these procedures are minimally invasive with robotic assistance. Nahum could not be tempted to predict the impact robots will have on market share in orthopedic surgery. A general guess has no real value, he said, and the sector is too fragmented across specialized segments and across geographies for a fine-grain projection to be practical.